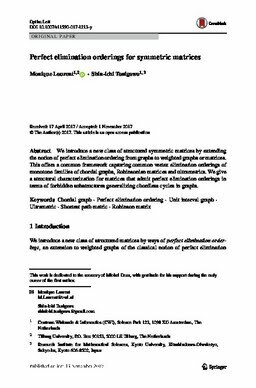 We introduce a new class of structured symmetric matrices by extending the notion of perfect elimination ordering from graphs to weighted graphs or matrices. This offers a common framework capturing common vertex elimination orderings of monotone families of chordal graphs, Robinsonian matrices and ultrametrics. We give a structural characterization for matrices that admit perfect elimination orderings in terms of forbidden substructures generalizing chordless cycles in graphs.